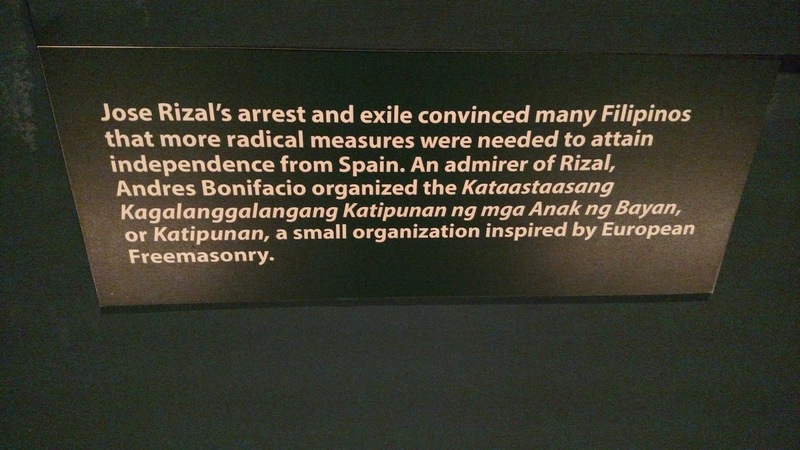 In the Ayala museum, there are three floors of exhibits. The fourth floor is the gold (see last week's post), next on the third floor are the porcelain and ceramics. Lots of interesting pieces covering the history of trade between the Philippines and China over a thousand years. Which makes sense give the proximity and the fact that many Chinese settled in the Philippines, but still had ties to their native country. The collection includes many pieces that were new to me. They had a selection of what is known as iron spotted pottery, because the artists dropped iron onto white porcelain which created brown spots, and white ware, which is, you guessed it, an all white ceramic glaze. Apparently, very prized. The familiar blue and white ceramic we associate with China is here as well, and there were some really nice pieces of that and the green ceramic too; ceremonial tea pots, jars and bowls. Also, on the 3rd floor are some more textiles; woven and embroidered and an exhibit of the artist Fernando Zobel; a Filipino who moved to Spain in his thirties to become an abstract artist. Some of his work was very interesting, but I think the museum is owned by his family and that is why they only had his art. Then on the 2nd floor are the dioramas and model ships. The model ships appear to be an interesting afterthought, maybe something the owner really liked. There are Chinese junkets as well as Spanish galleons and some others I didn't recognize. And the smallest was probably 3 feet long; the largest about 6 feet. 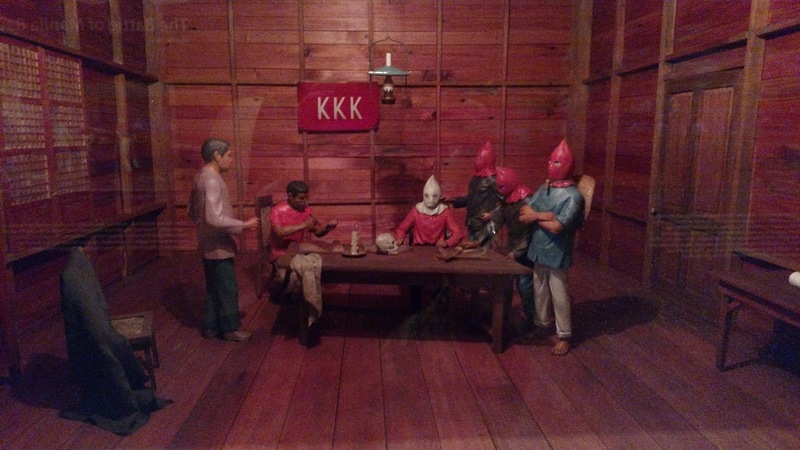 But the dioramas are a walk through the history of the Philippines and the Filipino people. Dioramas are an interesting way to depict any country's history; a little like using a comic strip. However, being new to the history of the Philippines--I knew a little of the Marcos' time but didn't really know the history--I thought this could be a good way to get the lightweight version. Again, I was wrong. 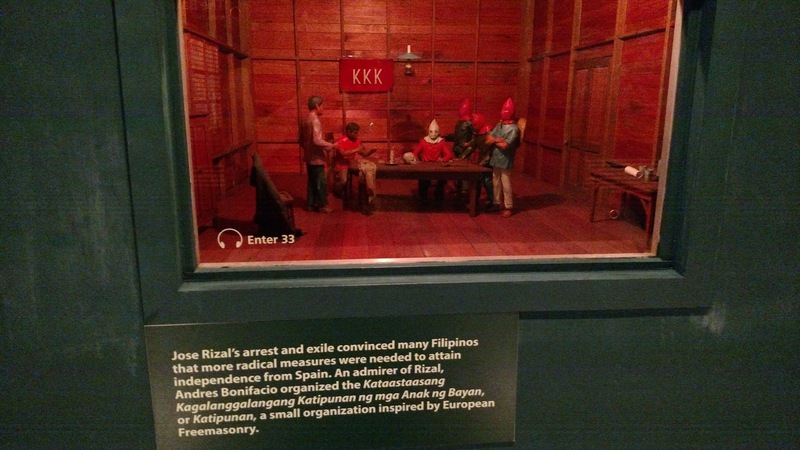 The dioramas start from the time of the earliest known Filipinos and cover the Spanish invasion and Chinese infiltration, Chinese pirates and Catholic priests, and the rise and death of Jose Rizal, General Aguinaldo and the American invasion; right on through to the rise of the Aquino's and the end of the tyrannical rule of Marcos. I was a little emotional when I got to the end, the assassination of Benigno "Ninoy" Aquino and the sudden thrusting onto the political stage of his widow, Corazon, was very moving. It didn't help that they had videos running of speeches made by the Aquino's and footage of the actual march on EDSA during which (similar to Tienanmen Square) tanks were sent by Marcos to take out the marchers. Very intense moment for me because I really didn't know what was going to happen. But the people climbed onto the tanks and exhorted the soldiers, their Filipino brethren, to break from the Marcos' and their despotic rule and march with them for freedom. They offered them food and water and solidarity and the soldiers climbed out of the tanks and joined them. That was when I understood the sculpture outside the Yuchengco museum.